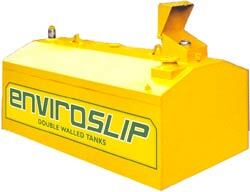 All ENVIROSLIP slip tanks (IBC) are Transport Canada registered (CAN/CGSB-43.146-2002). Four Models are available: 95, 135-Tall, 135-Short and our big 165 gallon. Enviroslip is dedicated to providing a superior slip tank (IBC) by using superior steel, enhanced welding techniques and pressed steel manufacturing processes. Enviroslip uses Pickled and Oiled steel for all products. P&O steel is proven to improve weld quality by preventing pitting and improving paint adhesion. Robotic Welding creates a superior weld. 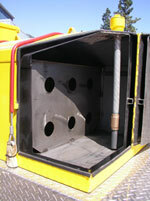 This is due to a continuous weld that enhances the structural integrity of the container. Manual welding unavoidably creates breaks in the welding seam, increasing the potential for defective products. Instead of forming steel using a mechanical break, Enviroslip uses a hydraulic press to form their steel. The press system creates more accurately formed joints, increasing weld precision and joint adhesion. Canadian Industrial Design registered U.S. Design Patent registered Enviroslip is the trademark of Enviroslip Manufacturing Ltd.